The Larsen C ice shelf is the primary focus of an upcoming expedition to Antarctica. But researchers will remain on the look out for wreckage of the historic ship. A British expedition to study Antarctica early next year hopes to find the remains of the Endurance, the ship at the heart of one of history’s great survival epics. The Endurance was carrying Antarctic explorer Ernest Shackleton when it was stranded in the ice of the Weddell Sea in February 1915. 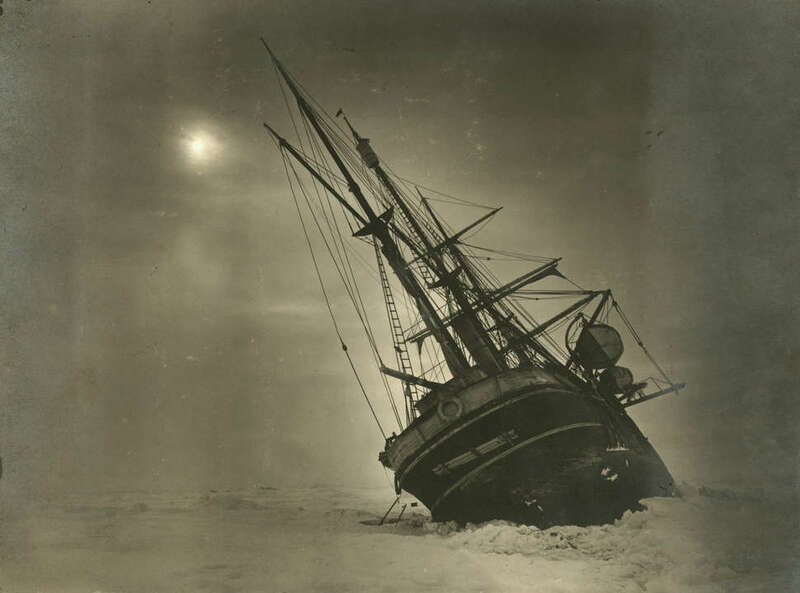 It drifted in the icepack for months before the floes ruptured the hull, leaving Shackleton and his party stranded. Julian Dowdeswell, director of the Scott Polar Research Institute at the University of Cambridge, told Seeker that finding the Endurance is a secondary goal of the January 2019 expedition. The main purpose is to study the Antarctic Peninsula’s Larsen C ice shelf, which shed a roughly Delaware-sized chunk of ice in 2017. But Dowdeswell said the Endurance may be “relatively intact” on the floor of the neighboring Weddell Sea, about 3,200 meters (10,000 feet) down. Endurance’s captain, Frank Worsley, recorded the ship’s position before it sank as about 270 miles east of the peninsula. Worsley was a master navigator whose sextant work also guided Shackleton and a handful of his men across 800 miles of open ocean to the British territory of South Georgia Island. That sextant and Worsley’s handwritten records are in the institute’s archives, Dowdeswell said. “We think the accuracy of that is probably better than about a kilometer, and maybe within half a kilometer,” he said. But while finding the grave of the Endurance is of historical interest, the expedition’s primary goal is to help understand the future — what might happen to Antarctica’s ice shelves and ice sheets, which are up to three miles thick in some spots, in a warming climate. The split in the Larsen C ice shelf in 2017 was the third major breakup in 22 years. In 1995, about 1,500 square kilometers (589 square miles) of the northern ice shelf collapsed, while the 3,200-square-km (1,250-square-mile) Larsen B ice shelf abruptly disintegrated in 2002. The ice from those shelves didn’t add to sea-level rise, since the ice was already in the water. But they remove a barrier to the continent’s land-based glaciers, which sped up their flow toward the sea after the earlier breakups, according to NASA. Dowdeswell, a glaciologist, and his team will map the contours of the Larsen C ice shelf from above and below, using unmanned submarines and drones. They’ll also take core samples and use radiocarbon dating in the hopes of learning how the shelf may have behaved in the 20,000 years since the last ice age was at its peak, he said. The 144-foot (44-meter) Endurance got stuck in the ice of Antarctica’s Weddell Sea in February 1915. It drifted with the floes for eight months before the ice ruptured the ship’s hull and sent it to the bottom. 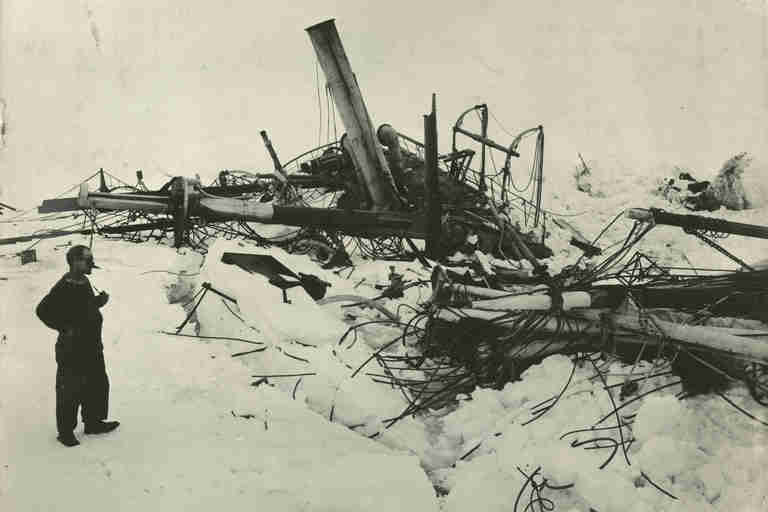 Shackleton and his crew abandoned ship and made camp on the ice from October 1915 through April 1916, surviving by hunting seals and penguins. Once the ice broke up, they sailed the ship’s lifeboats to the remote, rocky Elephant Island, off the tip of the Antarctic Peninsula. From there, Shackleton, Worsley and four others set out for South Georgia, where a ship was dispatched to retrieve the rest of the expedition. All hands from Endurance were rescued in August 1916. If Dowdeswell’s team finds the ship, they plan to take only photographs from the wreck and hope to get it preserved as an undersea monument.